The ProtoEV Challenge is the brainchild of Manchester based tech education specialists The Blair Project and Blackburn College’s Regional Automotive Technology Hub, with funding from Greater Manchester Higher and a range of sponsors and supporters including CAL International who specialize in designing and testing automotive concepts, Carbon Performance, PWHytek, Siemens, Northern Automotive Alliance, NIS Integrated Engineering and Prof John Perkins former Chief Scientific Adviser. All share a commitment to inspire and enthuse the next generation of technicians and engineers. Tragedy struck earlier this month when one of the school teams, Fred Longworth High School in Tyldesley, had their self-build kart stolen. Within hours of a crowdfunding campaign being set up to raise £4k to buy back the kart kit, the Morson Group in collaboration with the Morson Maker Space at The University of Salford stepped in to provide the sponsorship so the team could continue to compete. 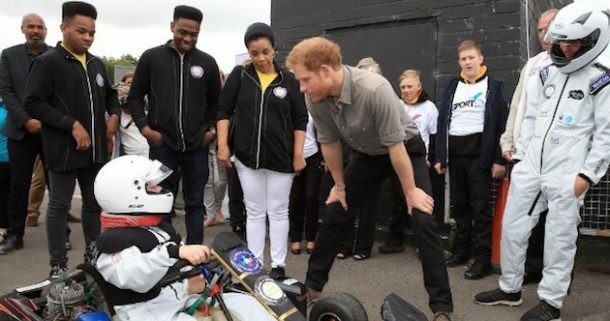 Blair Project CEO Nile Henry (22) said “The project is intended to inspire young people to get excited about science, technology and engineering using the exhilaration of motorsport innovation and design. There is a serious shortage of young people going into tech and engineering in the UK and the current school curriculum is not geared up to address it. A small delegation of pupils and teachers will travel to the USA this autumn to visit other cutting edge STEM projects in New York and Florida. For many pupils, it will be the first time they have travelled outside of the UK. The visit will also be used to develop greater transatlantic trade links for the partners and sponsors involved in the project helped by UK Trade & Investment and Greater Manchester Chamber of Commerce. The Blair Project has also begun working with international tech partners and gaming specialists in India to develop a Global E-Learning Platform which will use gamification to teach STEM principles in a way that taps into how young people learn best.